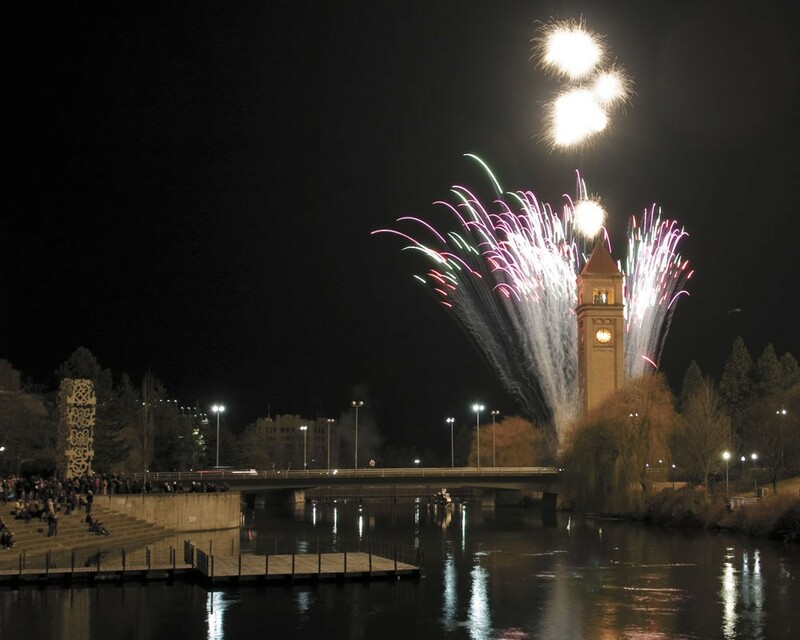 Fireworks are set to cap off a festive New Year's Eve in downtown Spokane. You know what? 2013 was kind of lame. It wasn't the worst year ever, but it was one we're glad to be putting to bed this week, and we suggest you give this year a solid kick out the door on New Year's Eve. Thankfully, Spokane has no shortage of happenings to bring in 2014, and hopefully all the good things that are going to come along with it. Take a look: there's something for everyone. There's something refreshing about getting dressed up for New Year's Eve. You're getting gussied up to meet the new year like it's a prom date. If you're looking classy, we suggest you get down to the Fox, where the Spokane Symphony is playing what might be one of the greatest pieces of music ever written — Beethoven's Ninth Symphony, conducted here by the Symphony's own Eckart Preu, with help from the symphony's chorale. Even if you don't fancy yourself a classical music fan, you know this one. It starts at 7:30 pm and tickets are between $16 and $28. Is the symphony just not your thing? You'd like beer instead of champagne — or maybe beer and champagne? That's fine. Rock and roll music has long had a great relationship with the last night of the year, and you'll find no shortage of it in downtown Spokane. We suggest you check out the Myth Ship, Camaros and DJ Case show at Carr's Corner. The neighborhood rock club is charging just $5 at the door, which includes some champagne (you can get that beer there, too, if you'd like) and unspecified party favors. We're hoping they mean noisemakers of some sort, because this is the only night of the year you can use those without getting a punch in the face. That show starts at 9:30. We'd be surprised if there's another New Year's Eve celebration geared toward families that would top the annual First Night Spokane arts and entertainment celebration, now in its 13th year. The all-ages event is packed so full with stuff to do, it's impossible to see it all, so you really do have to plan ahead (and dress warmly). After scouring this year's schedule, we've picked out some of our top recommendations for kids of all ages, from tots to teens. For the smallest celebrators, First Night offers Kids Night Out (3-6 pm), with all events held inside the warmth of the Spokane Convention Center. The lineup of magicians and silly performers are a delight for young audiences, including "The Noise Guy" Charlie Williams (at 4 and 5 pm), whose mouth-created sound effects have been recorded for videogames, cartoons and commercials. For groups with longer attention spans, don't miss the 48 Hour Film Festival, which features screenings — held in the City Council Chambers — of the contest's top eight short films, all made (obviously) in two days' time. There won't be a better excuse for another year to get all dolled up and drink/dance the night away. If you're planning to dress to the nines, get shopping now for that perfect sequined dress or swanky suit (after-Christmas sales rock). Leave the party planning aspect of it to us, with these celebration suggestions. Bling! in the New Year is the Lincoln Center's annual affair (9 pm, $50), featuring live music by local group 6 Foot Swing, a live DJ and plenty of prizes, including lots of, well, bling. If you want to get even fancier, the event includes a five-course VIP wine dinner before the party (7 pm, $100).